At 6:34 p.m., your mom buckles you into the back of the Range Rover. She drives to the first neighbor's house and waits in front of it until precisely 6:37 p.m., when she gives you permission to unbuckle and go up to the first door. Halloween Is for the Kid in YOU! Every year, kids continue to dress up in classic costumes. In fact, I would bet that when you open your door for trick-or-treaters, nine out of 10 times you'll see a superhero or a princess. 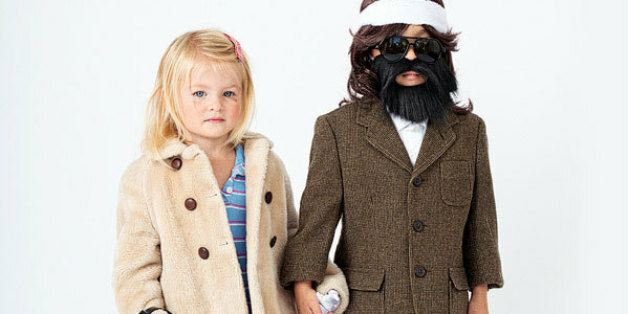 Join The 3rd Annual HuffPost Parents Halloween Parade Of Cute! What kind of mom am I that shops for costumes online? And who always has to pay extra shipping to get them in time? And what kind of mom tries to control what her kids wear? Don't I know before the photo opp the costumes will just tear? Halloween is a busy time of year for single moms with young kids. Picking the perfect costume can be time consuming and expensive. So why not opt out of those pricey, pre-made costumes and make your own? Here are five easy do-it-yourself costume ideas. As much as we love Halloween, the thought of buying a costume puts a damper on the holiday. Two years ago, my daughter startled us with a most unusual request for a costume: She wanted to dress up as Madonna. She was not even 5 at the time, so this raised some eyebrows in our house.